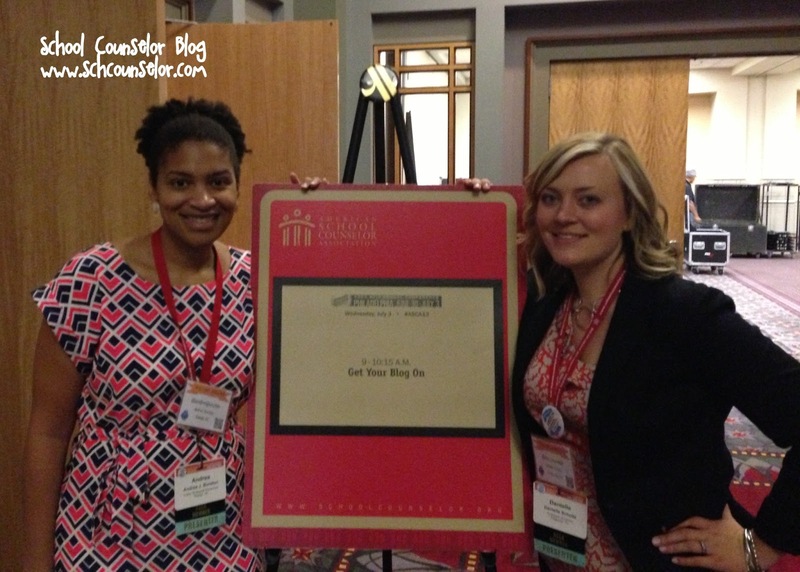 The final day of the conference blogger buddy +Andrea Burston and I presented Get Your Blog On! The purpose of our presentation was to share tips and tricks for starting and maintaining a professional school counseling blog. Andrea and me after our presentation! We drove home the point that if you can write an email, you can write a school counseling blog! It is really not that difficult to write and maintain a blog... you just have to do it! :) We focused on using Blogger to create a blog because it is very user-friendly and we both use it to host our blogs. I had a lot of fun presenting with Andrea. We received lots of great questions from participants about specific aspects of blogging. We even motivated participants to start their own school counseling blogs! You can view our presentation below and access a copy of our Get Your Blog On Google Doc containing helpful links about blogging. Have you started a blog since attending our session? Share it with me and I will add it to the list. If you want even more information about starting a blog, check out my webinar, Blogging in 5 Easy Steps, that I did for the ASCA webinar series! During our presentation we also shared how to keep up with your favorite school counselor blogs. Many blogs allow you to subscribe via email (to subscribe to School Counselor Blog via email, click here). If you want an easy way to keep up with all of your favorite school counseling blogs in one place, check out Pulse, Flipboard and Feedly. Pulse and Flipboard are both apps you can download for Apple and Android devices. They allow you to organize content from multiple sites including Facebook and Twitter. Feedly is my personal favorite for organizing blogs. I like that Feedly has apps available for Apple and Android devices, but also enables you to access your subscriptions in a web browser. Feedly allows you to easily add blogs you want to follow and organize them into categories. After our presentation we headed over to hear Rachel Simmons deliver the closing keynote. She was a great speaker and shared lots of great information about relational aggression. I love that she shares "Girl Tips" that could be used in groups, in classroom lessons, and on a bulletin board! I was totally bummed that I had to cut out of her keynote early to catch my train back to Pittsburgh. On the long train ride back I had time to reflect on all of the wonderful experiences I had at the ASCA Conference this year. I had an awesome time connecting and sharing with so many amazing school counselors. Attending the ASCA National conference is an experience unlike any other. It is such an unbelievable experience to be surrounded by so many school counselors who are passionate and enthusiastic about our profession! I am already looking forward to the ASCA conference next year in Orlando, FL!